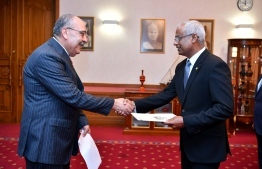 The Ambassador-Designates of France, Palestine and Uganda presented their credentials to President Ibrahim Mohamed Solih on Sunday. 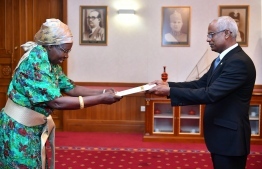 Ambassador-Designates Eric Lavertou of France, Walid A.M. Abu Ali of Palestine, and Grace Akello of Uganda presented their credentials at special ceremonies held at the President's Office. President Solih welcomed and congratulated the new ambassador-designates on their appointments, and discussed bilateral ties between Maldives, and France, Palestine and Uganda. The president conveyed his sincere gratitude to the French government for the development assistance extended to Maldives over the years, further highlighting the increasing number of tourists hailing from France to the archipelago. In turn, Ambassador Lavertou commended the peaceful conduct of the April 6 parliamentary elections and congratulated President Solih on the outcome. President Solih declared that Palestine holds a special place in the collective heart of Maldivians, and recalled the island nation's support for Palestine’s bid to gain formal recognition from the United Nations for its statehood. Ambassador Ali thanked the president for the Maldives' continuous support to the Palestinian people and assured his commitment to building on the friendly relations between the two allies. The president discussed opportunities to enhance existing ties between Maldives and Uganda in the areas of tourism, air connectivity and trade. He also conveyed his best regards to Ugandan President Yoseri Museveni. Ambassador Akello stated that it was a privilege to serve as the Ambassador of Uganda to the Maldives, and iterated her commitment to maintain the positive trajectory of relations between the two countries.